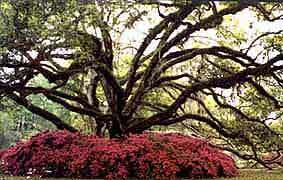 The Friends of De Leon Springs State Park is a citizens support organization (CSO). The Friends help the park in many different ways from fund raising to educational programs, special events and staffing for the visitor center. The park also has an active volunteer program. If you are interested in being a volunteer, please contact the park office. The 603 acres of De Leon Springs State Park offer a variety of activities. There is excellent swimming in the spring, which remains at 72 degrees year round. There is a ramped entrance to the spring pool. Swimming is not allowed in the spring run but anglers will find an abundance of bass and pan fish. At the park boat launch you can rent a boat or launch your own. A Florida freshwater fishing license is required for persons 16 years of age or older. Picnic facilities, a nature trail and a hiking trail are located in the park. Picnic pavilions may be reserved October through March. Pavilions are on a first come first served basis April through September. Volleyball, horseshoes and a playground area are also available. De Leon Springs State Park provides access to Lake Woodruff National Wildlife Refuge, where canoeists can explore 18,000 acres of lakes, creeks and marshes. The park's visitor center is open from 10:00 a.m. to 12:30 p.m. weekends and holidays. Contact the park office prior to planning a special trip. Native Americans occupied the area periodically from as early as 8000 B. C.. A 6,000-year-old dugout canoe, one of the oldest ever found in America, was discovered here. In the early 1500s, Spanish forces, possibly led by Juan Ponce de Leon, may have passed through. Florida belonged to Spain until 1763 when it was ceded to England. Seminole Indians began settling in the area. England gave this land to a company that traded European goods for the Indians' furs. In 1783 Spain returned to power and granted this land for plantations. A long line of planters cultivated cotton, corn and sugar cane on the plantation known as Spring Garden. In 1821 Florida became a U.S. territory. In 1832 the American artist John James Audubon visited Spring Garden, then owned by Colonel Orlando Rees. Rees built a waterwheel that harnessed the spring flow to grind his sugar cane. The plantation was sacked during the Second Seminole War (1835-42). General Zachary Taylor, commander of the U.S. Army in Florida, retook the springs from the Seminoles in 1838. During the Civil War, the spring-powered mill was used to grind corn and other stores for Confederate forces. Union troops eventually captured it and most of the facilities were destroyed. In the 1880s, the spring became a winter resort. To tourists, Florida was a tropical frontier still rich in mystery and romance. At De Leon Springs in 1889 an advertisement promised a fountain of youth impregnated with a deliciously healthy combination of soda and sulphur." In 1982, the state of Florida acquired the area for use as a recreation area. De Leon Springs still is a place for healthful outdoor recreation in a beautiful natural setting. One of the most popular attractions at De Leon Springs State Park is our unique restaurant. Located inside the Old Spanish Sugar Mill building you will find the Old Spanish Sugar Mill Grill and Griddle House. Here we grind grains on our French buhr millstones and use these flours to make pancake batters, breads and cookies. Each of our tables in the restaurant is equipped with a griddle in the center. We bring you pitchers of our homemade pancake batters. You may order blueberries, sausage, eggs or other items to accompany your pancakes. The fun of making your own pancakes is enjoyed year round by young and old alike. Although best known for our pancakes, we also serve sandwiches and salads. The restaurant also has a take out window for snacks and picnic treats. Canoe, kayak and paddleboat rentals are available in the park throughout the year. The De Leon Springs State Park is contiguous to the Woodruff National Wildlife Refuge. The Refuge area is easily accessed by water and provides excellent birding and fishing opportunities. 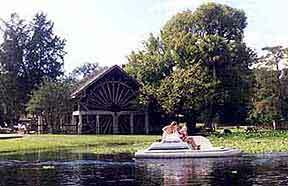 Paddleboats can be rented by the half hour and hour. Canoes and kayaks are available by the hour, half day (four hours) and full day. As there is no road access into the refuge, all rentals return to their point of departure at the park. All rentals must return to the dock by 4:45 p.m. and are available on a first come, first served basis. De Leon Springs State Park is located at the corner of Ponce de Leon Blvd. and Burt Parks Road in De Leon Springs, Florida.